The principle of Aquaponics is to work with an ecosystem composed of a multitude of living creatures evolving together in a closed system. The bacteria are transforming the ammonia into nitrite and into nitrate. By consuming the ammonia and nitrite toxic for the fish, the bacteria purify the water. From this point of view the system seem self-sufficient and no extra filtration seems needed. In reality, the media of a classic flood and drain system is slowly loading with organic matters and after few years some areas of the media can get clogged. In this case the system turns in anaerobic conditions which can have negative effects. A maintenance is required in order to allow those organic matters to be evacuated and the growbed cleaned. Adding an extra filtration to the system can help to keep the ammonia and nitrite levels lower as we will be able to remove part of the organic particles that would have naturally broken down into ammonia. We can use this organic matter for our classic garden and maintain our system at lower nitrogen concentration per fish biomass which theoretically allows us to stock more fish into our system. By removing part of those particles we decrease the clogging effect and therefore we can decrease the growbed maintenance frequency. In aquaponics we generally consider 2 types of filtration that are mechanical filtration and biological filtration. A third filtration rarely used in Aquaponics is called UV filtration. Mechanical filtration consist of filtering the water from the largest physical particles (generally organic particles). There are different types of mechanical filters, some are pushing the water through a screen/mesh/foam/membrane… and some are simply working with gravity. The gravity filters are very interesting as they don’t consume any specific power. In this last category we will talk about the Swirl filter and the Radial filter. Swirl filter: the Swirl filter works thanks to 2 forces that are the centrifugal force and the gravity. The loaded water (water from the fish tank) arrives into a large drum through a pipe with a tangential angle so the water flow is rotating following the wall of the drum. The particles are therefore pushed against the walls and are kept away from the centre of the drum where the evacuation pipe is. The particles then slowly fall down and accumulate on the bottom of the tank. You can then collect those particles either with a siphon or thanks to an evacuation with valve on the bottom of the tank. The larger the drum diameter is and the more efficient the swirl filter will be. Radial filter: the radial filter will work thanks to the gravity. In this filter we will modify the water speed based on the formula: Water flow = Surface x Speed. The water is entering the drum thanks to a pipe of a limited diameter coming from the bottom and raising up to the top of the tank. A pipe of a larger section is placed around the smaller pipe and dive down to 4/5th of the tank depth. When the water is released from the small pipe into the larger diameter pipe, the water speed decrease. This is due to the fact that the surface (or pipe section) of the pipe increase. Then the water falls down slowly and is finally released into the large drum where the section is huge. At this point the gravity force of the large particles is stronger than the force of the water speed and therefore the particles fall down the tank where they can be collected as in the swirl filter. The biological filters also called bio-filters or bio-reactors are generally composed of a media (plastic pearls / plastic balls / ceramic balls…) placed in an aerated tank. This media will be colonised by bacteria and the bacteria will contribute to the mineralization of the nitrogen released by the fish. Most of the current bio-filters are auto cleaned, they require a significant concentration of aeration to keep the media in movement which both provides an aerobic environment for the bacteria and also allows the pearls to move and chock each other so no thick organic matter can build up. The UV filter is designed to kill part or all of the bacteria, virus and algae in suspension into the water. It works thanks to a UV light placed around the running water (in transparent pipes). The UV can only be efficient on “clear water”. If the water is charged with particles the efficiency quickly decrease. UV filters are generally used in recirculated systems and placed after the mechanical filtration and just before the biological filter to avoid a contamination of the bio-filter by unwanted bacteria. It is also sometimes used after the biological filter to avoid some bacteria/virus to go into the fish tank. 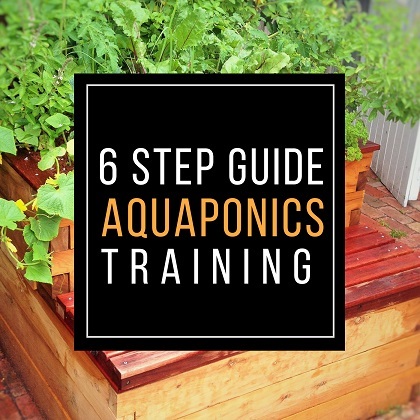 In backyard aquaponics the systems are completely open and a multitude of bacteria are constantly entering the system. The need of such a system is therefore reduced. UV filters are also used in ornamental ponds to kill the algae and therefore keep the water clear.